Recently I saw on television John McCain give a campaign speech referring to the Democratic candidates’ plan to pull US troops out of Iraq as quickly as feasible. But what does he mean? We invade and occupy someone else’s country then vow to never surrender it? 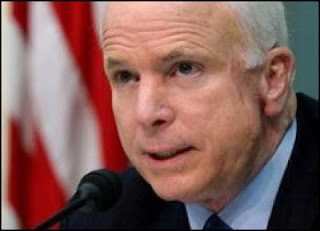 Does that mean McCain intends to keep Iraq as a permanent U.S. possession? To surrender is to give up possession of some thing or some power to someone else who asserts a claim to it; to relinquish control. McCain vows he will never do that. Does McCain propose to occupy Iraq forever? He has already stated that he is prepared for the U.S. to stay there 100 years. Maybe he has now extended his thinking to forever. What’s even more frightening and bizarre than McCain himself is the roaring crowd apparently agreeing with him. What could they possibly be thinking?